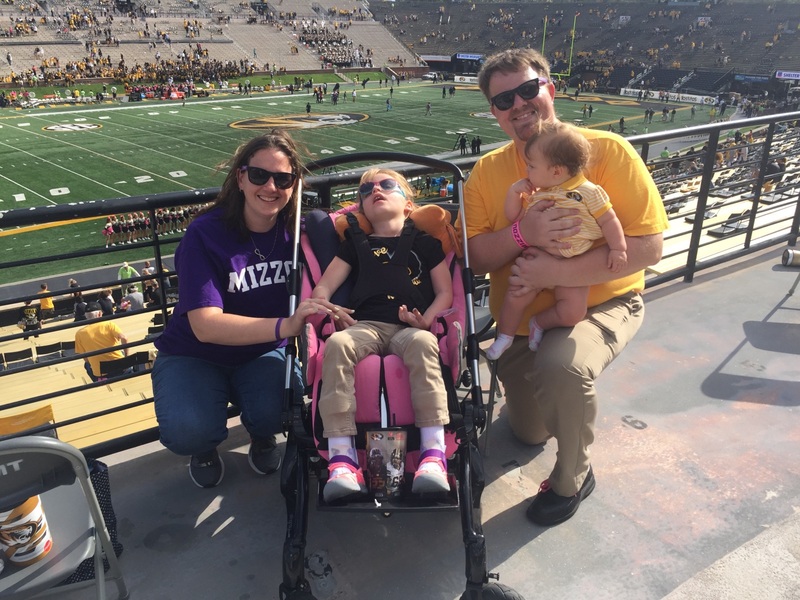 As I tossed and turned, trying to sleep in a recliner next to Grace's hospital bed, I couldn't help but think to myself how lucky we were to have made it six years without an overnight stay in the hospital. Between the beeping of the machines, the vital checks with the nurses and a chair that was definitely not designed for sleeping, I was definitely glad our first visit only lasted one night. 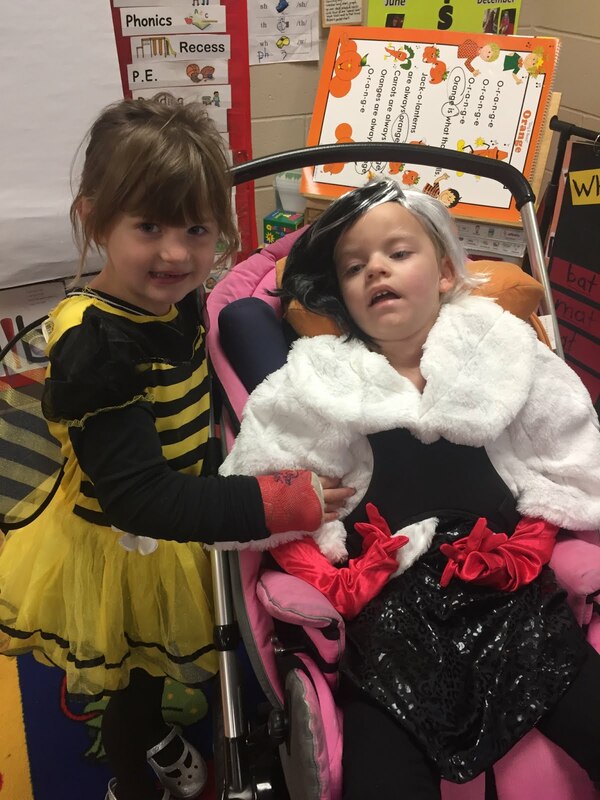 The week before Thanksgiving, Grace managed to pick up the same cold the rest of us had all week. But Grace has always had the uncanny ability to just sleep when she was sick. And usually a few days of extra sleep during the day was enough to get her healthy again. So, when Wednesday rolled around, and Grace was sound asleep at lunch, we decided to keep her home from school that afternoon. She took a four-hour nap that day. Since she only goes for a few hours in the afternoon, we also kept her home on Thursday afternoon, hoping the extra rest would help. By Thursday evening, she had a pretty good fever, but some Tylenol brought it down, and we thought she was feeling a little better. It just so happened that on Friday, she had a routine doctor's appointment. 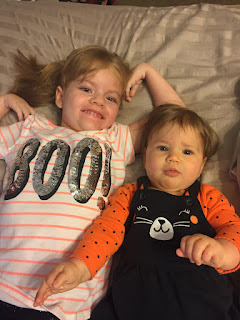 While we were there, her fever spiked, and after blood work and x-rays, they discovered Grace had pneumonia, which happens to be very common in INAD kids, due to low muscle tone and other respiratory issues. We were quickly sent on our way to St. John's Children's Hospital in Springfield, with no real indication of how long we would be there. There aren't many times that Grace cries anymore, so when she whined quite a bit during her blood work and x-rays, I knew she didn't feel good. My mind raced with all the possible scenarios, even wondering if we would have Grace with us through the holidays. Although pneumonia is very treatable, kids with INAD have a very hard time getting over it, and a routine doctor's visit quickly turned scary for us. Fortunately, Grace responded to another dose of Tylenol, and by the time we got to the hospital, she even had some smiles for us. The nurses were fantastic, and after a round of antibiotics, we got settled in for the night. Before calling it a night, I stopped by the nurse's desk for a question, quietly noticing many parents, just like us, trying to find a way to rest in the hospital room. 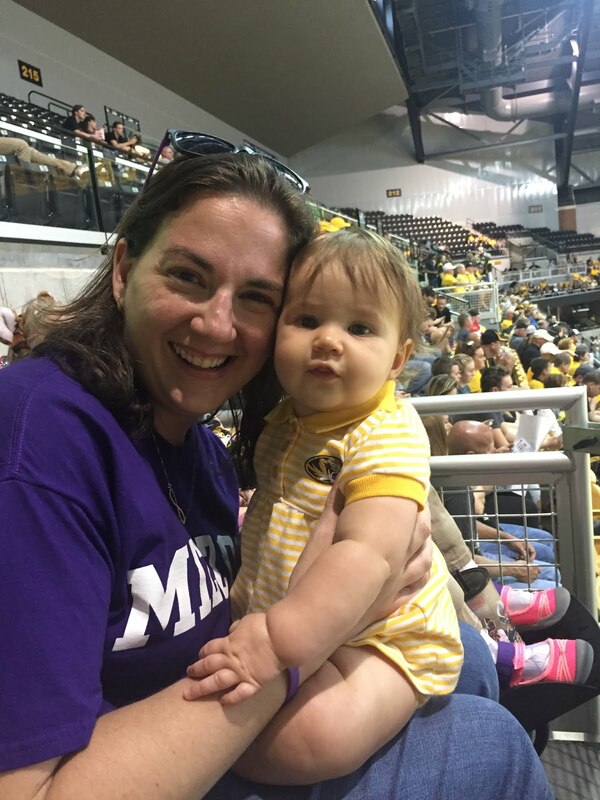 There were patients of all ages, from babies to teenagers, and lots and lots of worried parents, hoping and praying for their little ones to feel better. My mind wandered to those parents who have been in the hospital for days, weeks, even months with their children. The strength that must take seems almost unfathomable, though those parents I know would tell you they are just doing what needs to be done to help their child. I'm fortunate to know some pretty amazing parents, who have been strong and courageous in the face of life's hardest circumstances. Grace had a great night, and we were discharged the very next afternoon, much to our delight. She still had to take medicine all week long, but everyone got more rest at home. And Charlotte, who spent the night with my parents, had a big, sloppy kiss for me the moment I walked in the door. Kyle and I can't say enough good things about Grace's doctor for getting us to the hospital, and the hospital staff for taking such good care of us when we were there. All things considered, it was a pretty amazing stay for our first overnight hospital trip. If you've never had to try and sleep in a hospital bed next to your child overnight, count all your blessings at least twice, and remember how lucky you are to have healthy children, even if they make you want to pull your hair out sometimes. 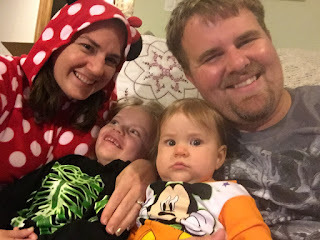 Although we were lucky to make it six years without a hospital visit, Kyle and I know it's very likely we will be looking to have more overnight trips to the hospital in the future. There will be times that we won't be so lucky to only stay one night. But we are grateful to have each other and wonderful families to help out when we need it. I can't say it's exactly how I wanted to spend my weekend, but it could have been much worse. 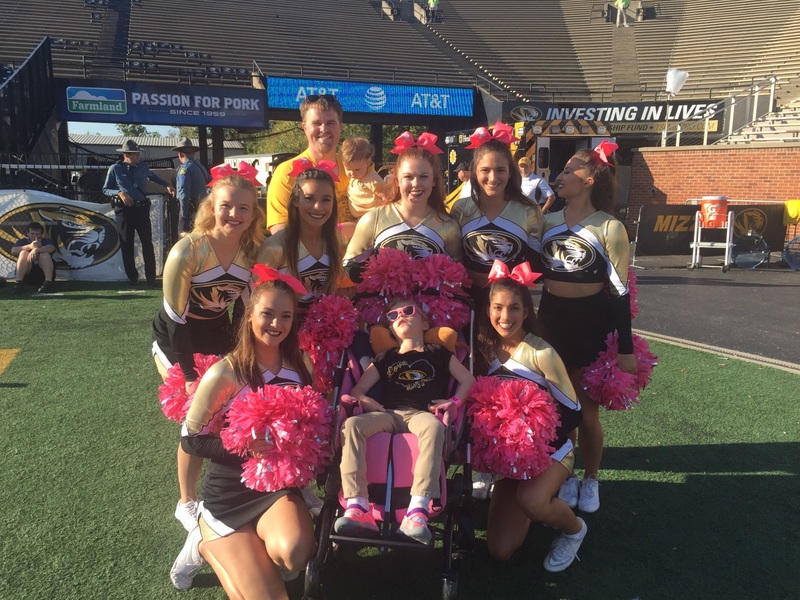 We had a chance to share Grace's story with some pretty wonderful medical staff, and we know they will be there to take care of us the next time as well. After all, it's just another adventure on our Grace-Filled Journey. 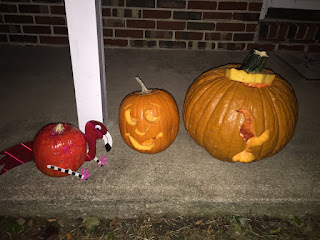 We've officially taken down our one Halloween decoration (of course, it's a pirate sign) and thrown our pumpkins away for the season. 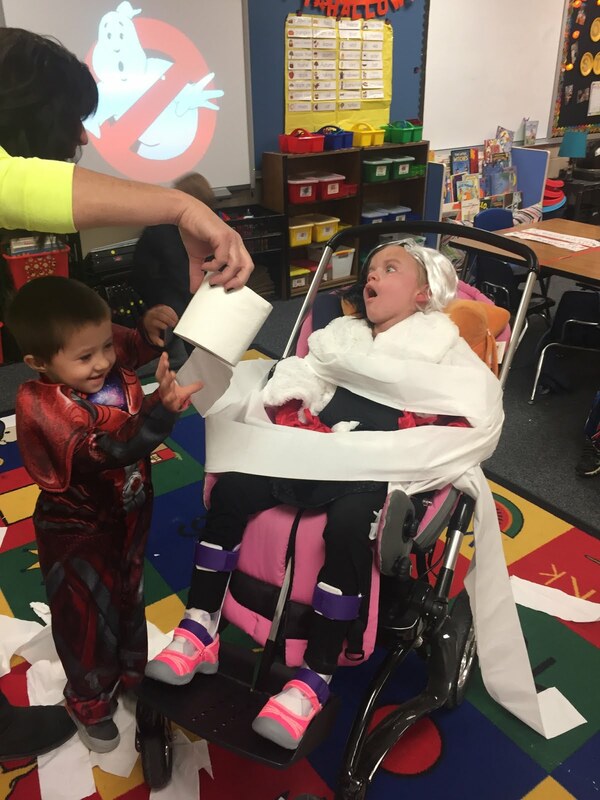 And though we look forward to spending the upcoming holidays with family and friends, Halloween is always one of our favorites! 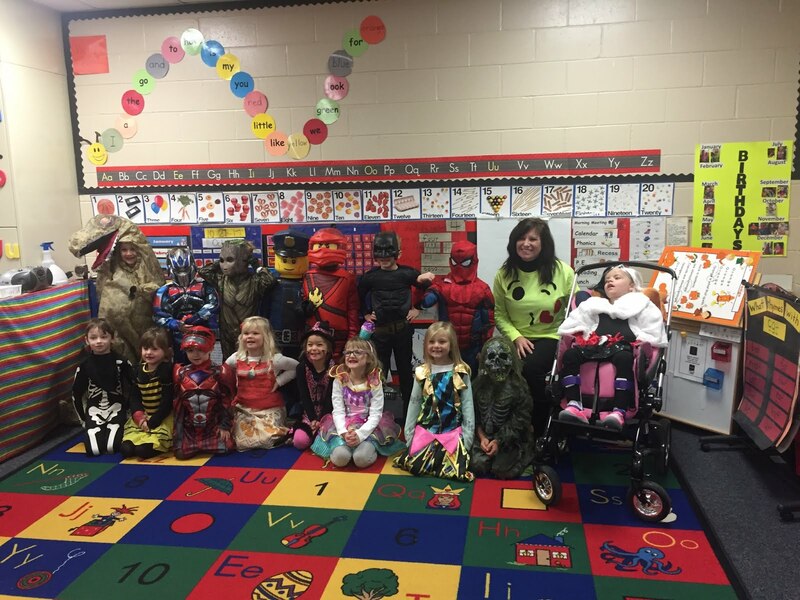 Grace with her classmates in their Halloween costumes. Grace and her friends in the Halloween parade. It's always been fun to pick out costumes for Grace. One year, she wore a clown costume that my grandma made for me when I was little, and another year, we picked out Minnie Mouse because that was always one of Grace's favorites. 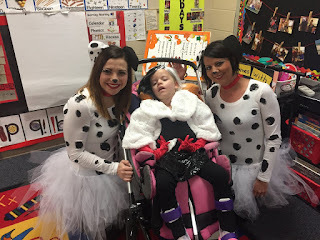 Grace and her dalmation puppies at school! Grace agreed to get her picture taken with me, but she wouldn't smile. 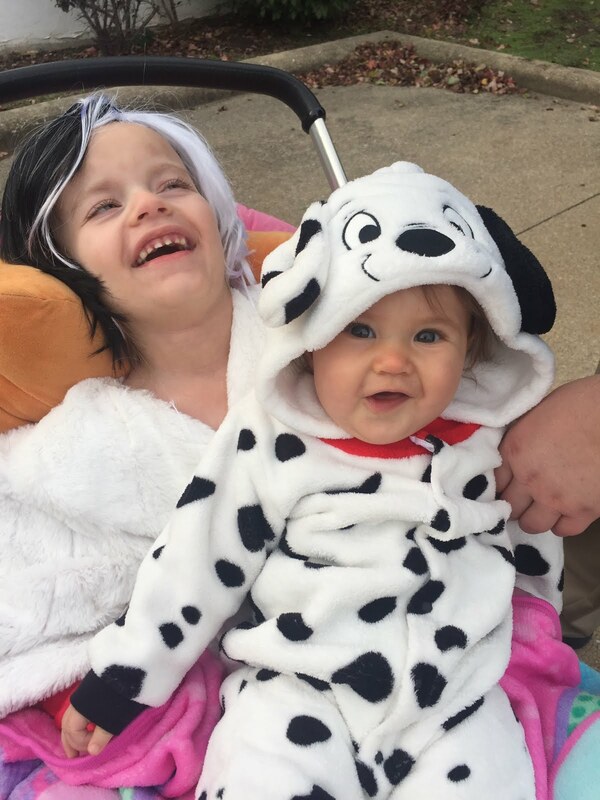 With the addition of Charlotte to our family this year, we decided to coordinate costumes together, and went through a ton of ideas. 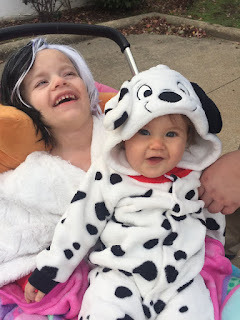 But we kept coming back to Grace as Cruella deVil and Charlotte as her little dalmatian puppy. And with a little help from the Disney Store, we were all set. 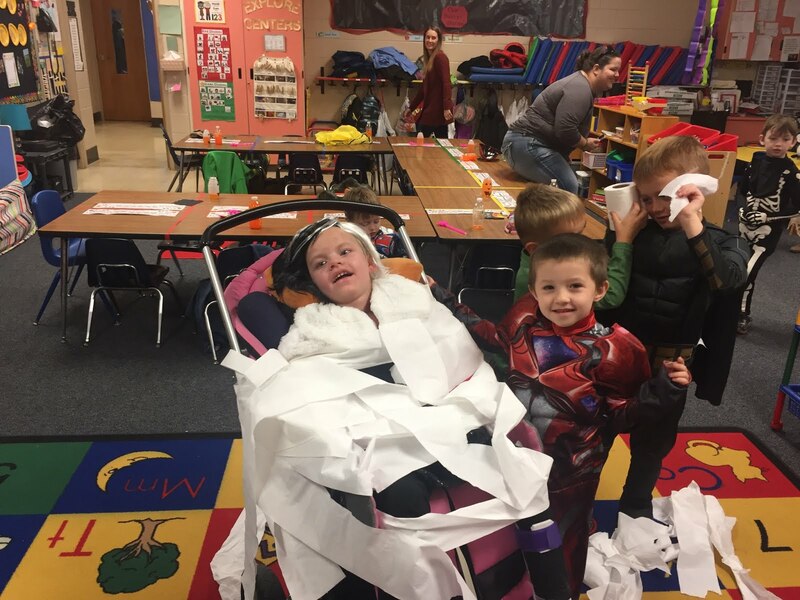 Grace was excited to be part of the mummy game. Grace thought her friends were funny. 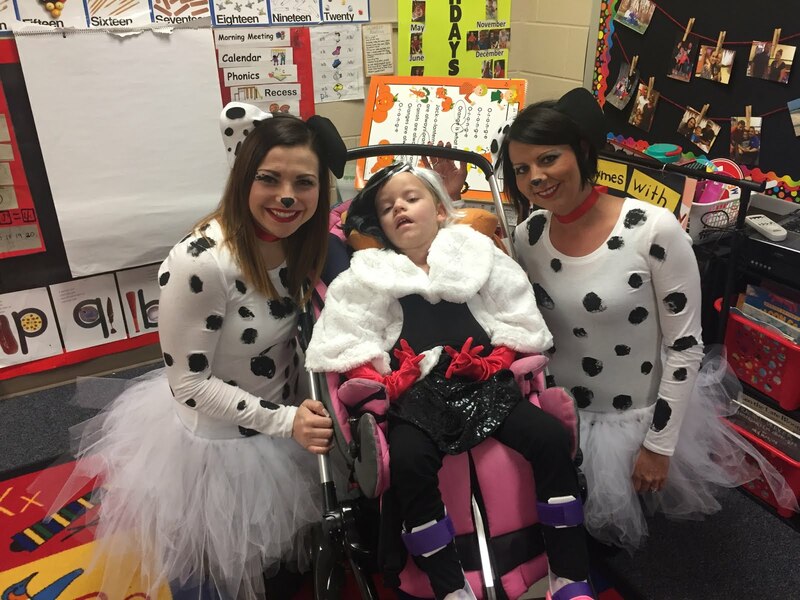 Although Grace usually has physical therapy in Springfield on Friday mornings, we cancelled the Friday before Halloween so Grace could celebrate with her classmates at school. I got to take Grace to school for the Halloween parade around the building with her class, and then enjoy the party with the other kindergarten students. I think Grace's favorite was a mummy game where two of her friends wrapped her up in toilet paper. I'm constantly moved by how much the kids in her class love Grace for who she is. It's pretty special. 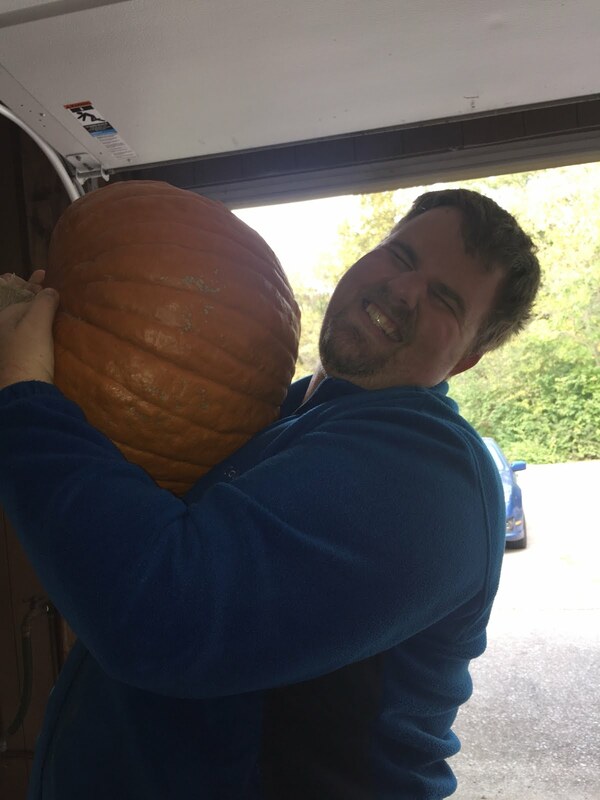 Kyle might have picked out a giant pumpkin to carve. 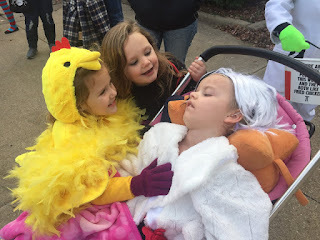 Later that afternoon, after some naps of course, we ventured uptown for the annual Halloween parade. We had to stop by our friend and photographer Ken Meade for some pictures first. But I really like the Halloween parade, even if it is a little chilly. 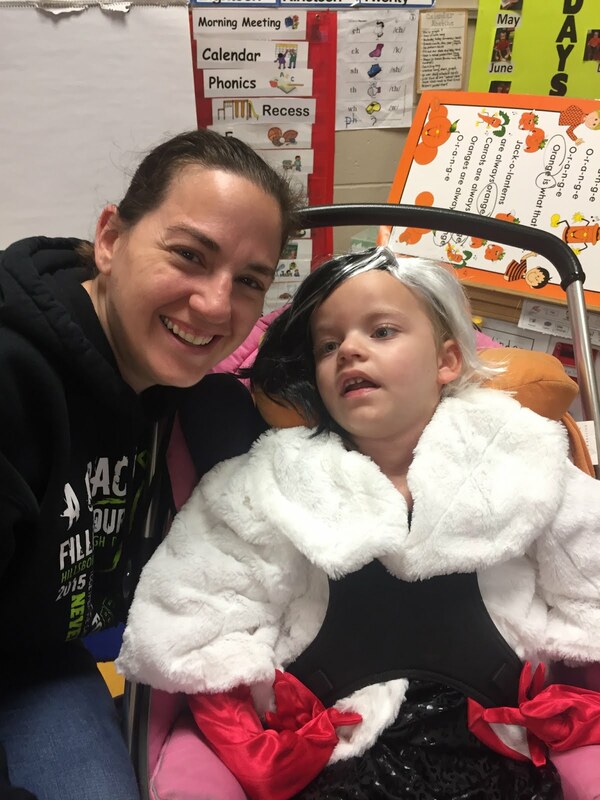 For us, it's something that Grace can participate in just like the other kids, which is pretty cool. Grace and Charley won third place in the groups division, and both girls really seemed to love the attention from everyone. Grace's friends from preschool stopped to see her at the parade. 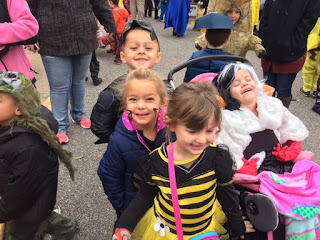 My favorite little characters in the parade. 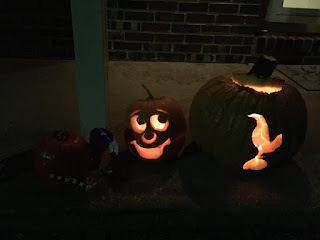 That weekend was our annual pumpkin carving, which is always lots of fun. Charley was a little impatient and took a nap during part of it, but Grace always seems to enjoy being with us. I always pick a pattern, and Kyle still hates to clean the "pumpkin yuck" out of his pumpkin. We also watched "The Great Pumpkin Charlie Brown" which is another favorite at our house.There's always lots of laughter and fun memories. And I can't wait for Charley to be big enough to help out. 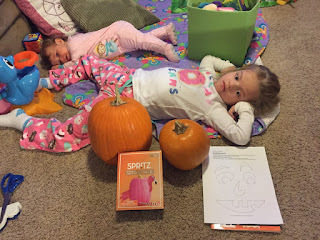 Getting ready to carve pumpkins. 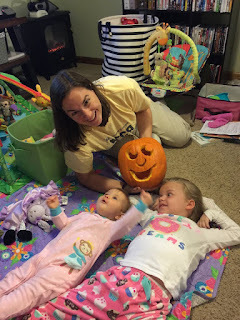 The girls loved my pumpkin! 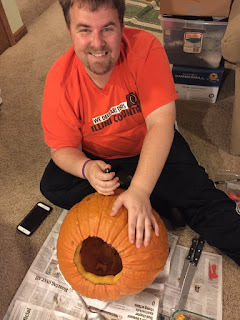 Kyle carving his huge pumpkin. 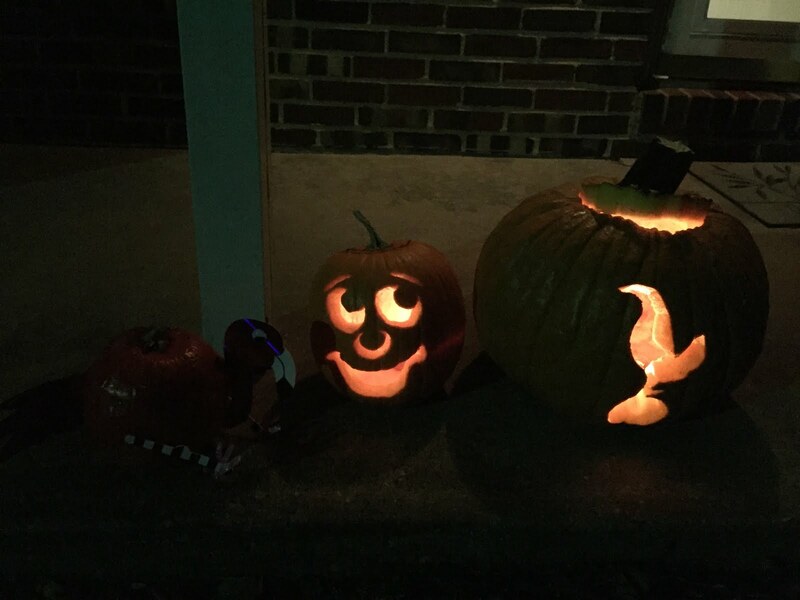 Since neither girl can eat candy, we sort of skipped trick-or-treating this year. 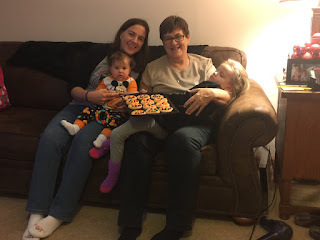 Instead, we spent the first trick-or-treat night greeting friends at Grandma and Grandpa Galer's house. We also got to decorate sugar cookies with pumpkin faces. Both girls got a taste of icing, and Charley's quick fingers almost got her an M&M. But she'll have to wait for another day. The girls looked so cute in their Halloween outfits. We had fun decorating cookies with Grandma Susie. Family photo opportunity in Halloween pajamas. Over the years we have been together, it has been fun to take memories from our childhood and recreate them together, as well as make a few new fun, family traditions. It will be fun to see what costumes Charley picks over the years, and whether or not she wants to carve pumpkins with us. But whatever the holidays bring, I know we will always make the best memories just being together. This month, we had the chance to take both our girls to their first college football game at my alma mater, the University of Missouri, and it ended up being a special event for our whole family. Kyle and I often talk of things we want to do with Grace. I don't like to call it a bucket list, because that sounds too final for me. We just talk about experiences we want her to have while she's with us, and we hope that's a really long time! 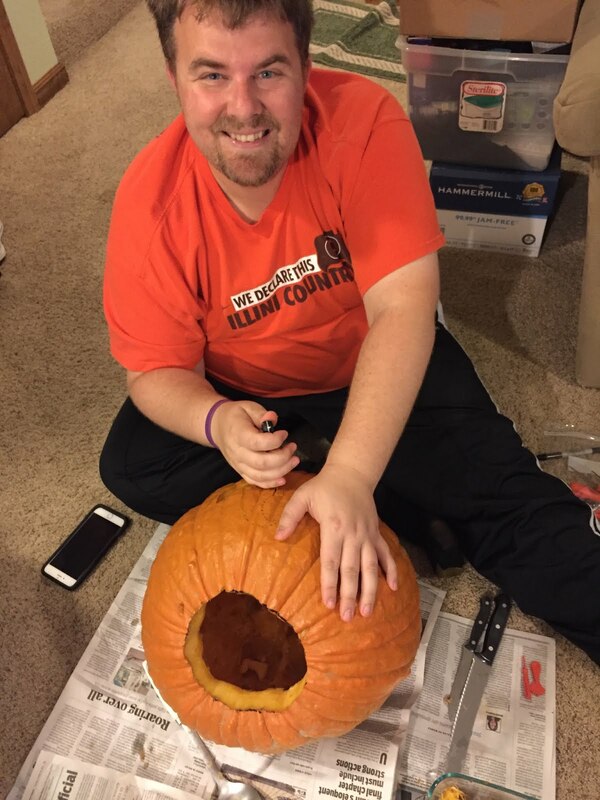 Since Kyle's the sports editor at the paper, a lot of the things we like to do as a family center around sports. We can often be found with the girls at a variety of high school events to see some of our favorite kids play. But we also love to go and see the Cardinals play in St. Louis. A hockey game with the Blues is also on our list. But it's not just Kyle that loves sports. 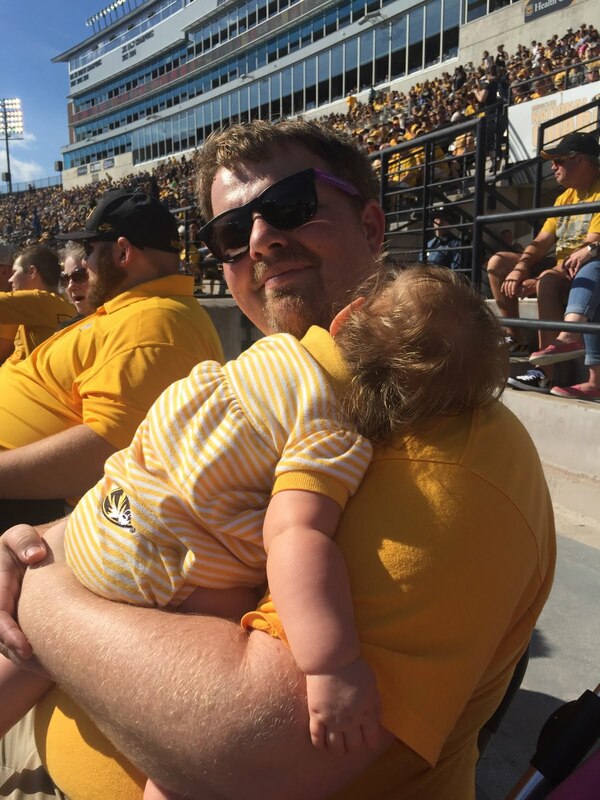 In fact, of the two of us, I'm probably a bigger fan of college sports, especially football. And I've been known to throw my Tiger ears at the TV a time or two. It got me thinking about what it was that first got me interested in sports. And I remembered the first time in sixth grade when a friend invited me to a junior high basketball game. I went out to the garage and selected a couple of my favorite coloring books and some crayons and decided I was ready to go. My mom patiently explained that it probably wasn't the best idea to take those with me. I think she worried the other kids would make fun of me. But I couldn't possibly imagine what I would do at the basketball game for the whole time we were there. I would say it took maybe five minutes or less after the start of the game that I found myself cheering for the Dragons and totally involved in the game. From then on, I knew I never needed much encouragement to attend a variety of sporting events. I didn't always know about the plays or even all of the rules, especially when I started going to high school football games, but I was always a big fan of my team. 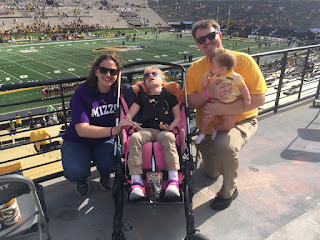 And that's why I wanted to take our girls to a Mizzou football game. 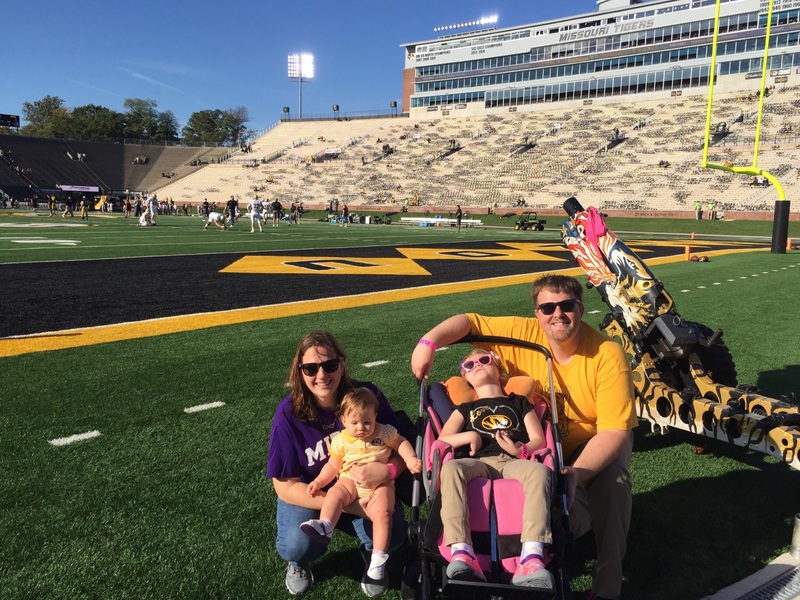 It had probably been ten years since I saw a game at Faurot Field. Fall is one of Kyle's busiest times covering high school sports, and it just hadn't worked out. 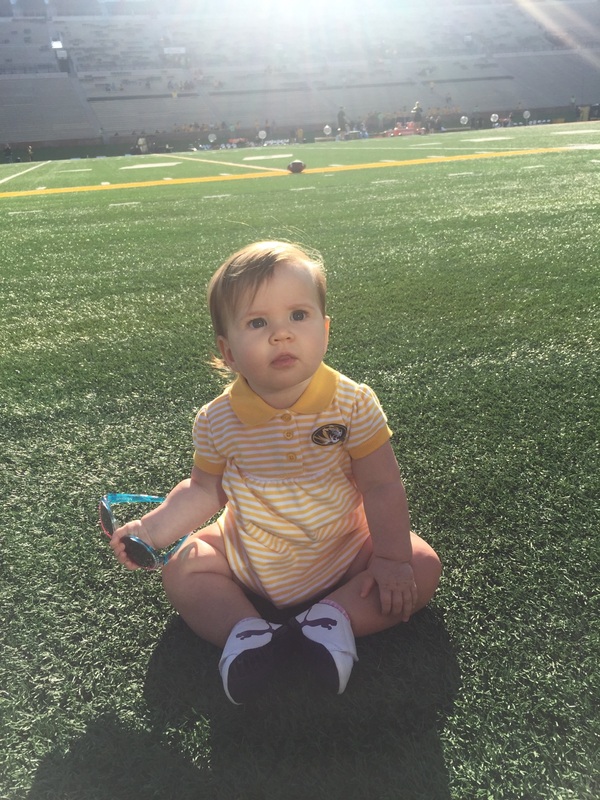 But as luck would have it, Mizzou's Homecoming weekend seemed to be a perfect fit. I'd forgotten about some of the chaos of going to a big-time event, like finding parking or bag searches, but we made it. And it was definitely worth it. 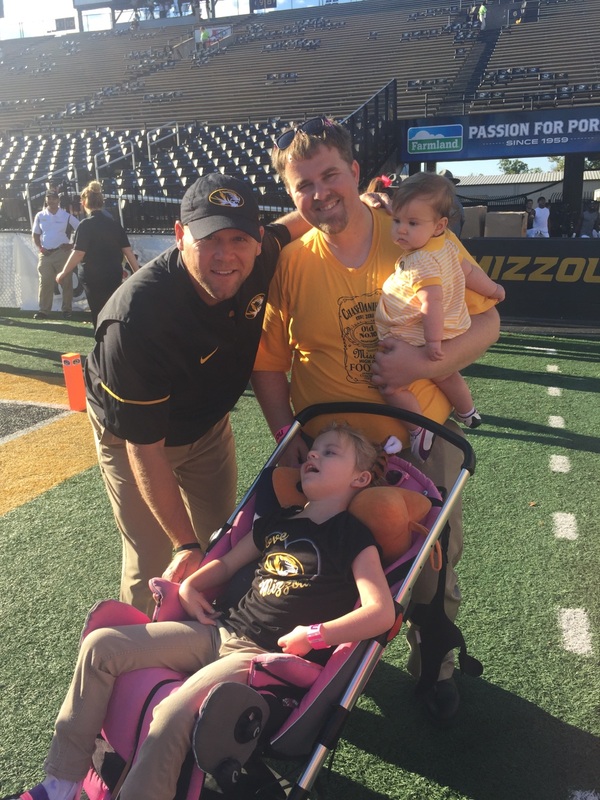 Prior to the game, I had contacted Mizzou's head football coach, Barry Odom, about helping us to raise awareness for INAD. 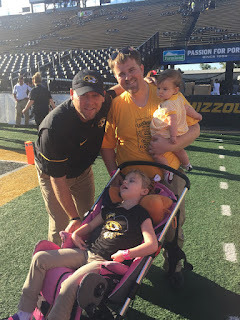 His wife responded to our request, and we had a chance to meet both of them before the game. Talk about making a special experience even more magical. 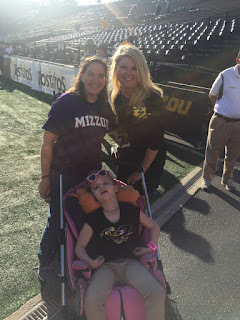 The Odoms were such genuine people, welcoming us onto the field before the game. 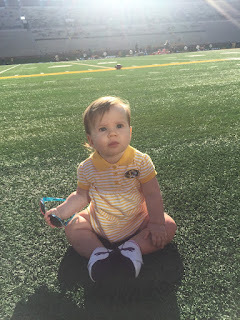 And we had so much fun walking around the field, just being part of the college football experience. The cheerleaders came over to get their photo taken with Grace, and a warm rush of memories just flooded through me. From participating in Marching Mizzou for a year to taking photos of the sidelines, I will always be a Tiger. And I'm glad that I got to share a football game with my whole family. The weather was perfect, and we stopped by to check out this year's men's and women's basketball preview at Mizzou Arena before we headed out. 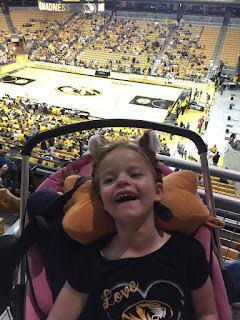 It's still on my list to get Grace to see a Mizzou men's basketball game too. 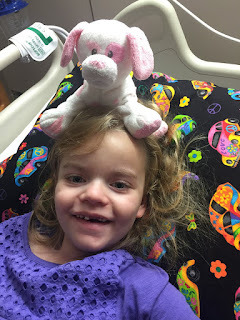 As Grace's condition continues to regress, we don't know how long we will be able to take her places with us. And I didn't want to wait to see what next year brought before we tried to get to a football game. Someday, it won't matter whether or not we made it to that football game, but I'm so glad it was something that we got to do together. Although Kyle and I are probably not the most competitive or the most athletically talented people, there's definitely something about sports that brings people together. We have seen it time and time again as our high school teams rally to help us raise funding and awareness for INAD. Win or lose, we consider all of these special programs to be part of Team Grace. And that makes every single player and coach a winner in our book.